I feel your pain! While I am right-handed, I grew up in a household where everyone else was left-handed, and I witnessed their struggle every day. However, when it came time to learn how to crochet, this situation came to be useful! I sat opposite my mother and mimicked her steps as if looking in a mirror and caught onto the process very easily. If you’re left-handed, you’ll hold your hook in your left hand and use your right hand to hold the yarn and maintain your tension. Once you’ve mastered learning the basic crochet stitches, you’re ready to move onto reading patterns and making more complicated pieces. The trouble is that patterns are traditionally written for the right-handed crocheter. The most important thing to remember is that as a left-handed person, you’ll be working your stitches from left to right while the right-handed crocheters work from right to left. When working rows, your finished work will look the same as a right-handed crocheter’s, except your rows will end on the right. If you’re working something in the round, such as a crochet hat, lefties work the rounds counter-clockwise as opposed to the right-handed clockwise. You’ll find that most crochet patterns can easily be worked for either the right or left-handed person. On basic patterns, you’ll just need to keep in mind that you’ll have to adjust certain aspects of the pattern, such as instructions on which side to join a new colors or shaping. If the instructions indicate to insert your hook in the next stitch to the left, remember that you’ll do the same, but you’ll insert in the next stitch to the right. Once you practice enough, this will become almost “muscle memory” and you’ll rarely get hung up on the process. If you have a chart to work from, remember that you’ll need to begin reading the chart from left to right. If you have something directional, such as a colorwork design that is asymmetrical, it might be best to sit down with a sheet of graph paper and reverse everything before working so that you do not accidently reverse your design. Being a leftie in a righty crafting world can sometimes be frustrating, but once you figure out the tricks to master your left-handed craft, you’ll be finishing up projects in no time. Don’t forget that if you get really stuck that there are whole YouTube channels and websites dedicated to left-handed crocheters! Just keep practicing, and you’ll soon have the automatic “leftie-translate” process down. Alternatively, since left handed people tend to be significantly more ambidextrous than right handed people (probably from years of adjusting to a right handed world) you can just crochet right handed and not have to account for these adjustments. I am left handed and I find it much easier to crochet right handed than to jump through hoops to follow a pattern/tutorial/etc. I really like this issue. 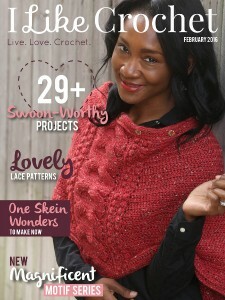 This is the only crochet magazine where I actually like ALL the projects and feel that I can accomplish them. Thank you for a fantastic issue!